Following up on this blog post giving background info on Bière de Garde and French brewing around 1900, this post gets into the brewing side of historic Bière de Garde. As noted in the background post, these beers are distinct from the modern northern French beers of the same name. As a brief comment on the modern side, I learned recently from Daniel Thiriez of Brasserie Thiriez that there is a new (well, ~1 year old) French law regarding what can be called a Bière de Garde - the beers now must be aged a minimum of 21 days after primary. We agreed that this law seems to be a bit toothless and quite broad, as there is no recipe restriction, etc. And 21 days is a far cry from the 6+ months of aging for Bière de Garde from around 1900. 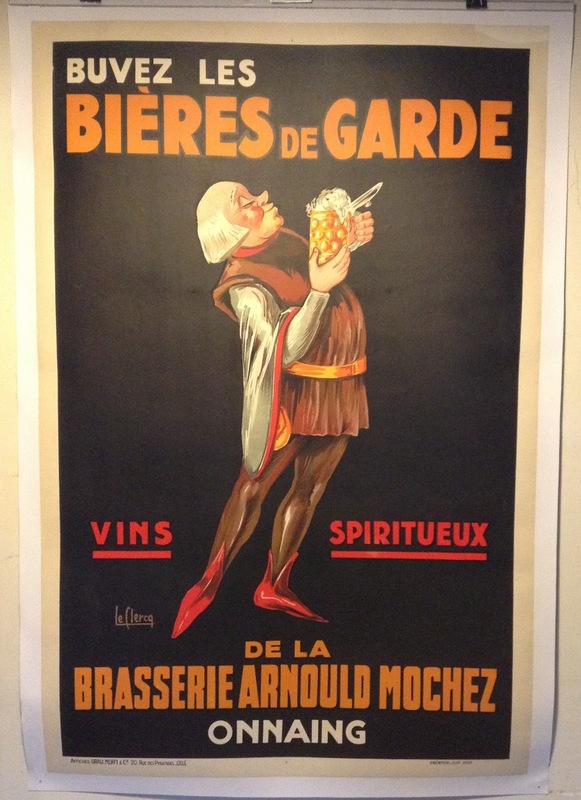 Bière de Garde advertisement from the early 1900s. The information for this post is a synthesis of 9 texts from 1850 to the early 1900s. These texts present a view from more established breweries, and spanning the time from the height of Bière de Garde to near when the original long-aged mixed culture versions disappeared. While each of the texts has small differences from the others, the general nature of the beer remains the same - a roughly amber colored beer of mixed fermentation with a moderate hopping and which is allowed to become acidic and vinous over 6+ months of aging. The grist composition of Bière de Garde was 100% malted barley which, for the time, was kilned using older methods. Direct heat was used and that the malt came out slightly toward amber. I think something along the lines of a continental European Pale Ale malt is about right given the descriptions of the final beer color and the process. The recommended barley was the Escourgeon, or winter 6-row barley. This was the common grain for much the area (across Belgium you often see the same recommendation) and it could be a bit of a sharp or coarse malt. Escourgeon had more polyphenols and higher nitrogen levels, which would help to develop more melanoidin compounds in kilning and boiling. This sort of malt wasn't great for softer or quicker turnaround beers, but it was well suited for aged beers. Hops for Bière de Garde were primarily coming from the Nord region or Belgium. These hops were of more standard quality. This may present a bit of a challenge to the modern brewer, but French landrace hops may be a good place to start. Some sources also mention a portion of higher quality hops coming from Bavaria, Bohemia, or other regions of France, so this gives modern brewers some more options. Yeast was pitched for Bière de Garde, and based on the descriptions of the final beers it was a mixed culture involving at least Brettanomyces and lactic acid bacteria in addition to Saccharomyces. Figuier, quoting Müller (1873), notes that Bière de Garde, and in general the beers of this region, had a vinous quality and that this quality was sought by locals. Bière de Garde is described as an golden-amber or brown beer (sometimes both by the same source, suggesting that "brown" may have been used more generally or encompassed a wider range than it does now). Either way, from this I suspect the beers were generally not toward the darker side of brown, and a pale amber may be a better description for the modern brewer/beer drinker. The paler side of amber seems to fit better with the above photo. 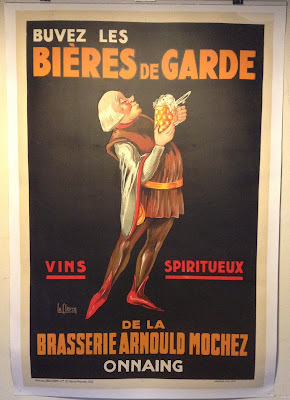 Though I'll note that the original of that print was from 1930, and therefore after Bière de Garde as discussed here had mostly (if not fully) vanished. This table (below), modified slightly from a similar one posted a couple weeks ago on the blog's FB page, shows the parameters of ~1900 Bière de Garde alongside 1970s & modern lambic and geuze as well as modern Flanders acidic ales. Taking these 5 examples of Bière de Garde, the OG that one could expect around 1900 was roughly 1.045. This sounds a little low to me, so I wouldn't be surprised if gravities that were a bit higher (~1.050-1.055) were also brewed. But I haven't seen other gravities listed so far. With a very high attenuation, the alcohol of these examples generally comes out to around 6% ABV. The acidity of the beers was fairly high, both in lactic and acetic acidity. On the whole the acid profiles compare well with Flanders acidic ales before they are blended back with younger beer for packaging, though BdG was a bit lower in lactic acid than these Flanders beers. And the acidity also compares well with more sharp lambics, but when averaging across multiple producers from the 1970s, ~1900 BdG is higher in both lactic and acetic acid. A comparison of ~1900 Bière de Garde with some modern aged acidic beers. -An initial infusion is conducted. Some texts have this rest temperature quite cool (25-35 C, some even lower than this) and others have it higher, in the protein conversion range. -After the first rest, the wort is drained off and heated to a boil in a secondary boil kettle. This is the one turbid pull used in Bière de Garde mashing. -Hot water (somewhere from 80 C to boiling) is added back to the grain bed to raise the temperature to the cooler end of the saccharification range. The mash rests here for a while. -Wort is extracted and transferred to the primary boil kettle. Now the turbid wort which has been boiled comes back to the grain, and an additional saccharification step is now carried out with this wort. -After the second saccharification this wort is combined with the earlier mash runnings in the primary boil kettle. -The grain bed is sparged, more or less as normal, though much of this wort is used for table beers rather than Bière de Garde. Here are a couple mash schemes from historic texts. First is a scheme based on the information in Bauby & Fournier (1868), taking into account the mashing that Bauby & Fournier report, the modifications they suggest, and filling in some gaps with reasoning and similar general schemes described by other sources. The second is a reproduction of the mashing scheme I presented in this blog post, which originally comes from Evans (1905). A couple of sources I looked at have the initial rest closer to 50 C rather than the cool starts of both of these mashes. But otherwise these other mashes follow a similar remaining process to these two. Finally, for reading the figures below, blue arrows represent transfer of liquid (removal of turbid wort, infusions, collecting final wort). 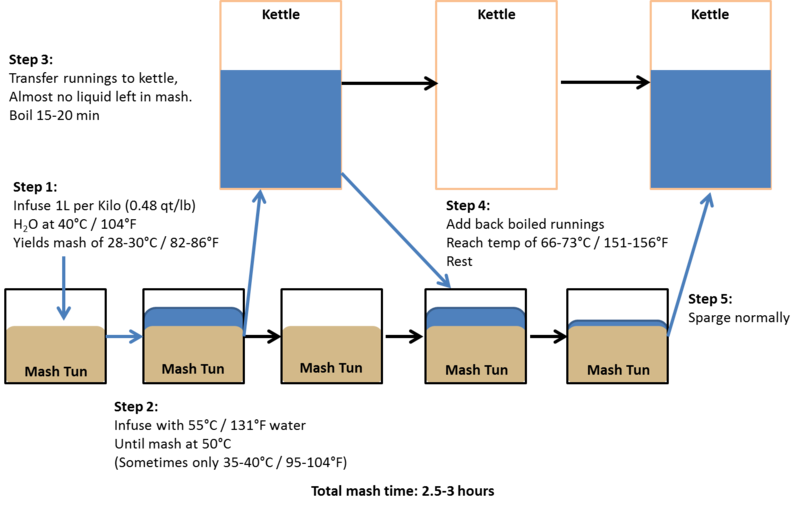 A mashing scheme based off of Bauby & Fournier (1868). There are a couple general things to keep in mind with these mashing schemes. First, these mashes reflect non-modern conditions. Rest times could probably be shortened a bit if you wanted to try these yourself. Also, with the sort of equipment used in these breweries at this time, there was a much larger heat loss to the vessels than with modern equipment when raising the mash temperature. Additionally, it would not be uncommon to have an open topped mash tun, which would also lose a good deal of heat. Jean-Louis Dits of Brasserie à Vapeur has such a mash tun, and he reported temperature drops of up to 2 C per 30 minutes (see this post for more info about their mashing). So if you want to try one of these mashes yourself, you may want to lower the infusion temps to hit your targets and keep extra cold water around in case you overshoot. Finally, not everything is specified with these mashes to the extent that I would like (especially in the mash based on Bauby & Fournier). 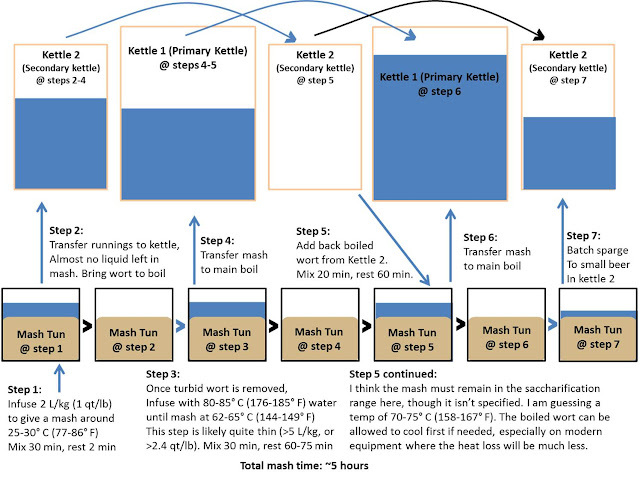 I have tried to fill in the gaps with what is reasonable given the mash process up to that point, expected heat loss, and what the wort would need to be like. And I have tried to present the remaining uncertainty to these assumptions. The mashing scheme presented in Evans (1905). Boiling: Bière de Garde underwent a long boiling. The sources agree on at least a 5 hour boil, with many mentioning boils lasting up to 8-10 hours. Considering this, the gravity is fairly moderate at around 1.040-1.050. The English brewers discussing the boil in Evans (1905) also note that they were surprised that the boil did not darken the beers as much as they expected. At the end of the boil the beers were cooled in coolships. Fermentation: As noted above, Bière de Garde was pitched with a mixed culture, though at a lower rate than would have been common for most beers at the time. Fermentation began somewhere from around 20-25 C. Some later sources note the temperature may have started a bit cooler (~17-21 C). The beers were fermented in casks, generally the same casks as used for transport, and active fermentation took around 3 days. Following the primary fermentation, the beers were aged for around 6 months or more, during which time the beers developed acidity and vinous character. Having discussed BdG recipe and process, I think it is noteworthy that the descriptions of French Bière de Garde are quite similar to the descriptions of Saison in Belgian sources from around the same time. Suggested malts, mashing process, hops, boiling time, etc. are in general basically the same for these two beers. This is not surprising given that the Nord department borders the Hainaut province and that the beers share similar origin lore, but I think it is worth pointing out anyway. considering historic Bière de Garde? 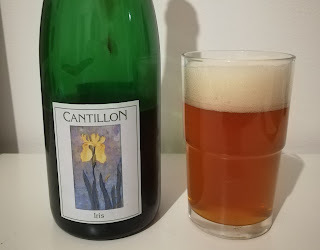 Finally, I think it may be helpful to contextualize historic Bière de Garde by considering Cantillon's Iris. Perhaps this is a bit of a tired reference. When considering the above BdG-Saison comparison, I know I frequently say something to this effect and it is also in the De Baets chapter on Saison history in Farmhouse Ales. But I think the similarities are sufficient to bring it up again. Both are 100% malted barley (even more so - malt of about the right color) and also turbid mashed. The hopping rates are similar (though BdG was hopped a bit more and Iris is dry hopped). They both have a long boil and then are cooled in a coolship. Of course there are the important differences that Iris is spontaneously fermented while BdG was pitched with a mixed culture, Iris uses some aged hops, and Iris is aged longer. But still I think Iris probably falls closer to ~1900 BdG than many other modern beers would. Bauby & Fournier (1868). Guide Raisonné de la Fabrication de la Bière. Boulin (1889). Manuel Pratique de la Fabrication de la Bière. Evans (1905). The Beers and Brewing Systems of Northern France. Petit Journal du Brasseur (1910). Mulo (I don't know the year). Brasseur ou Art de Faire Toutes Sortes de Bières. Thanks also to Daniel Thiriez and Yvan De Baets for conversations that helped with organizing my thoughts about these beers. I'm not convinced that 'spontaneous' fermentation at Cantillon involves much more than racking wort into their inoculated barrels. And of course the beer would have been stored in barrels. Nice article and good connection to Iris. Regarding spontaneous fermentation, I think there is a valid point to be made that barrels are important for inoculation as well. But I think there some anecdotal evidence suggesting that there is likely more than just barrels inoculating the wort. For example, lambic going into "new" (to the brewery) barrels still produce lambic of the nature of that brewery. And Cantillon wort fermented at other producers still behaves "Cantillon-y". So I do think barrels are important, but I'm not convinced at the moment that they are the exclusive source of inoculant. It would be good to see more study on this sort of topic though. I think you made a mistake translating one sentence of the "Manuel Pratique de la Fermentation de la Bière" of Boulin. en hiver la bière dite de garde redoutent beaucoup l'introduction dans leur levure du saccharomyces pastorianus qui communique aux bières un goût vineux très prononcé" It means that the brewers fear for the beer to be vinous and it means it was not a quality or something wanted. My thoughts are that Bière de Garde were not so sour and i can not find any text that says they were acidic or lactic. Pasteur works were well advanced at that time, it was the age d'or of beer due to problem with winyard and i think the process of fermentation were controlled. Great blog, great job ! Hope to see you someday if you come to France ! Thanks for following the blog and for your comment here! And sorry for my delay in getting back to you. I've been traveling for work and am only recently back home. Thanks for bringing this to my attention. I see this sentence that you are referring to. This comes in the general fermentation section of the book, and is not in a section dealing specifically with Bière de Garde from the north of France. The term Bière de Garde gets applied generally at this time and can mean different things depending on which region is specifically being discussed (I give some examples of this in this blog post: http://www.horscategoriebrewing.com/2017/10/introductory-thoughts-on-biere-de-garde.html). While Boulin doesn't mention acidity at all (presence or lack of it) in the section on beer from the North of France, I am inclined to believe that the sentence you mention about avoiding vinous character does not apply to Bières de Garde from the north of France. I think assuming that fermentation was microbially pure simply because the state of the industry (at least in some places) had advanced such that microbially pure fermentation could occur can lead to error. There are other factors that would influence whether a brewery actually did adapt their brewing in this way (e.g. local consumer taste preferences, some regions being slow to modernize in process for whatever reason, etc.). I also think that "vinous" may not exclusively be tied to acidity, as I think it includes Brettanomyces flavor character, but that is a bit of another topic. Here is some of my reasoning for why I think northern French Bières de Garde were acidic at this time. 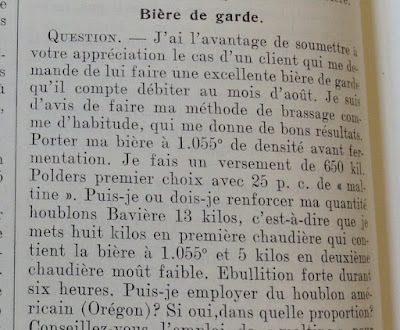 -Moreau & Levy (1905) Traité complet de la fabrication des bières: "On les prepare surtout en hiver et au printemps, et on les conserve trois à quatre mois, ou jusqu’à ce qu’elles aient pris un gout dur, vineux et légèrement acide." This is found on p. 533 when specifically discussing N French BdG, and suggests that vinous and acidic characteristics are signs that a BdG is ready. -Figuier Les Merveilles de l'Industrie... INDUSTRIES AGRICOLES ET ALIMENTAIRES (1876 I think, but I don't know for sure): "Ces bières, comme généralement toutes les bières du Nord, sont très-vineuses, qualité recherchée dans cette contrée." This shows up on p.406 when specifically discussion production of BdG from Lille. Figuier is pulling this information from Muller's Manuel du brasseur (1873). This sentence notes that not only was northern French BdG vinous, but that consumers wanted this characteristic and it was generally found in other beers of the region at this time. -Evans, The Beers and Brewing Systems of Northern France (1905): "Old Beer (Biere de Garde).—Purposely allowed to become acid, and at the same time acquiring a vinous flavour." This is on p. 234 and, as with the other examples, is specifically about BdG from the north of France. In addition, the table in this post which lists specific acidity levels is based on data from northern French BdG around 1900. So I am pretty confident that northern French Bière de Garde was acidic at this time. I'm glad you're enjoying the blog and I'd be happy to meet you as well! Since I live in Switzerland, I think it is quite likely that I could find myself in France at some point. Thanks again for your message and thanks for following the blog!